Cupcakes with sprinkles--inside and out. 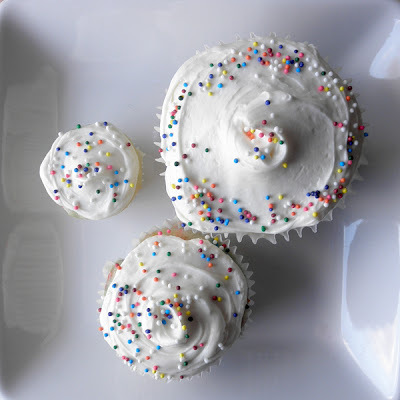 Vanilla cupcakes in 3 sizes. This manner of baking cupcakes made 6 jumbo, 6 regular, and 12 mini sized cupcakes. I think I'm only posting this for the pictures because the "recipe" is nothing spectacular. Prepare cupcake pans (one jumbo 6 cup pan; one regular 6 cup pan; and one mini 12 cup pan) by lining with white cupcake liners. Mix cake mix, eggs, oil, and water on low for 30 seconds to combine. Scrape the bowl and mix on medium for 2 minutes. Pour half the batter into a large zip top bag. Gently stir nonpareils into the remaining batter and then scrape into another large zip top bag. Bake the jumbo and regular pan for about 15 minutes, or until a toothpick inserted into the center comes out clean. Then bake the mini pan for 8-10 minutes, or until a toothpick comes out clean. 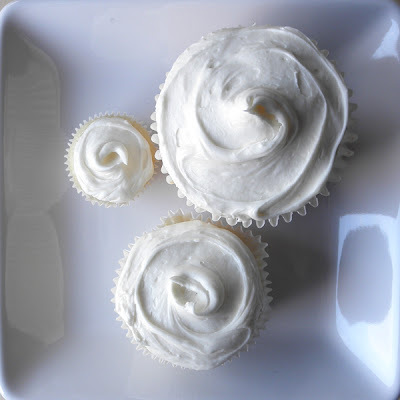 In order to make this more complicated, I'm telling you that I whipped the canned frosting with 1/4 cup powdered sugar to make it more stiff and airy. Then I frosted the cupcakes, sprinkling the frosted sprinkle cupcakes with more nonpareils immediately after frosting them. Makes 24 cupcakes of varying sizes. So simple and easy to cook! Still so delicious!